DTA-2115B - DekTec All-Standard VHF/UHF/L-Band Modulator for PCI Express Bus | AdvancedDigital Inc.
Highest-end modulator for satellite, terrestrial and cable standards, up to the latest standards such as ATSC 3.0. The DTA-2115B can be a single-channel 72-MHz bandwidth modulator, or it can function as eight independent 8-MHz modulators. The standard firmware of the DTA-2115B implements a universal modulator with 72-MHz bandwidth, agile over VHF, UHF and L-band. A block diagram of this firmware is shown below. Special features include GPS synchronization to 1-pps and 10-MHz inputs, and phase noise emulation. The DTC-385-HW8CH option, also included in DTA-2115B-GOLD, enables the 8x 8-MHz firmware variant (select with DtInfo). It contains 8 independent 8-MHz modulators that can be set to different (or the same) modulation standards, e.g. 2x DVB-T2, 2x DVB-C, 3x ATSC and 1x ISDB-T.
Each of the 8 modulators is fully agile over the VHF and UHF band. The carriers can be positioned anywhere in this band, independent of each other. 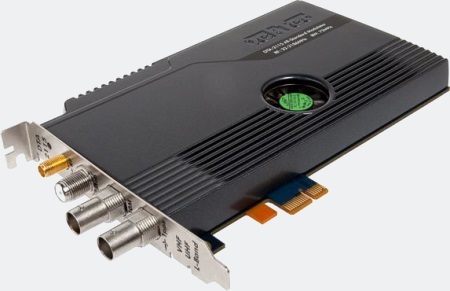 DTA-2115B-SP – All-standard VHF/UHF/L-band modulator for PCIe with StreamXpress player software.